The adjustments are being made throughout Seattle's 34 paid parking areas, after an annual analysis of city parking data. Street parking rates are changing again in Seattle, with some going up and some going down. 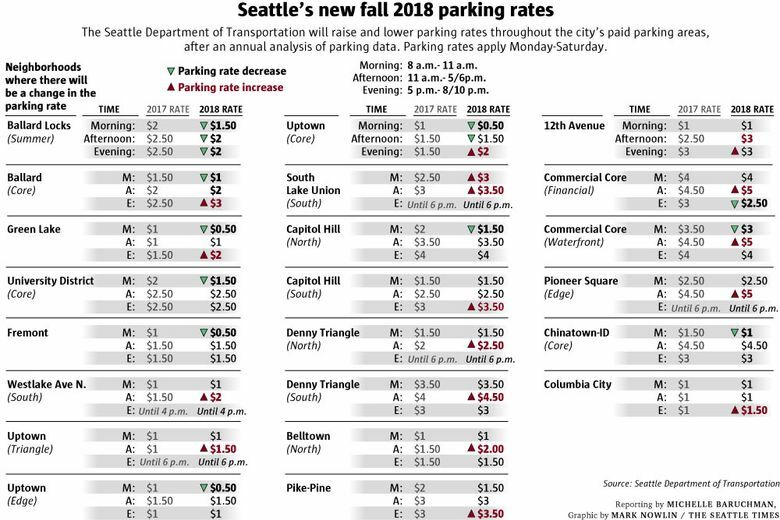 The rate adjustments are being made throughout Seattle’s 34 paid parking areas, after an annual analysis of city parking data. These areas, which contain about 12,000 on-street paid parking spaces, were evaluated for how full they were during morning, afternoon and evening hours on Tuesdays, Wednesdays and Thursdays in mostly March and April of this year. The city aims to keep parking occupancy — the percentage of spots filled with cars — in a target range of 70 to 85 percent, leaving one to two open spaces available per block. The city then makes pricing changes based on supply and demand: If rates are too high, not enough people are parking and spaces sit empty; if rates are too low, too many people try to park and it becomes harder for those who need a space to find one. Areas above or below target are adjusted by 50-cent increments up to a maximum of $5 per hour. Areas within 5 percent of target are placed on a “watch list,” with rate changes deferred for one year. All rate changes will be implemented this fall, according to the analysis. SDOT plans to collect data in spring 2019 to inform rate changes for fall 2019. The highest rates will be in the downtown core and Pioneer Square, where prices will increase to $5 per hour between 11 a.m. and 6 p.m.
Seattle is expected to collect $39.4 million in street-parking revenue this year, said SDOT spokeswoman Mafara Hobson. Here are a few of the changes being planned. Based on 2017 data, SDOT extended paid parking hours from 8 p.m. until 10 p.m. in Capitol Hill and the Pike-Pine paid parking zones. This year, SDOT will increase rates to $3.50 an hour in the evening in the southern portion of Capitol Hill and the Pike-Pine area. 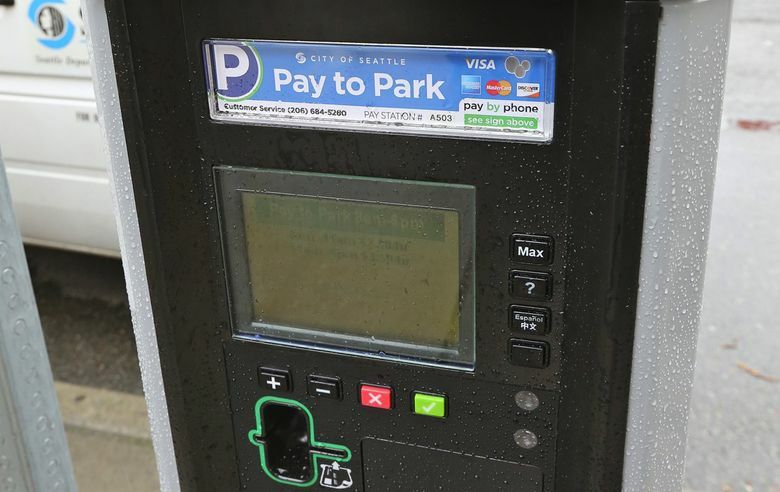 “Charging for parking during the late evening is intended to improve access and provide more reliable parking availability for people visiting Capitol Hill for restaurants, retail, and night life,” according to a city report on the parking analysis. SDOT will also increase rates to $3 from $2.50 in the Ballard core in the evening and consider extending paid parking to 10 p.m. In Cherry Hill, many drivers display state-issued disabled parking permits in their vehicle windows. Under Washington state law, vehicles with a valid disabled permit can park on the street for free and for longer than the posted time limits. Raising rates is unlikely to improve parking availability, the analysis found. Instead, SDOT is considering creating two new sections of paid on-street parking near medical offices, adding new designated spaces for vehicles with disabled permits, and restricting all on-street paid parking spaces in the Cherry Hill area to 4-hour parking. On First Hill, many vehicles also display disabled parking permits or use SDOT-issued Restricted Parking Zone (RPZ) permits. Vehicles with RPZ permits for the area can park on certain blocks in First Hill at no cost and for up to 72 hours. Parking occupancy in these areas was at times measured above 100 percent — meaning more cars were parked than space was supposed to allow. Vehicles with RPZ permits occupied most spaces. The agency will reassess blocks that allow RPZ parking, create designated spaces for people with disabled permits, add a 4-hour time limit, and study ways to improve access near hospitals. In late 2017, SDOT implemented paid parking, load zones, disabled parking, unpaid time limits and RPZ spaces in Columbia City. Prior to implementation, “parking on commercial streets in Columbia City was completely full for much of the day. Following implementation, “drivers are much more likely to find a space,” the report found. Rates will increase from $1 an hour to $1.50 an hour between 5 p.m. and 8 p.m.